Now press Function/Set and down once to get to the White Balance menu, which probably has Auto (AWB) selected. Press the right arrow button to get over to Custom, where it will say "Evaluate White Bal.". Point at a deep blue surface, the kind of blue in RGB (or red, if you're using a red filter). The Infragram kits have shipped with a square of appropriately colored paper. At the bottom of this post is a square of "pure" blue, though I'm not sure if it'll work to point it at the screen. Press MENU to "set" the white balance. Press Function/Set to begin taking photographs. The camera will have to be in Program mode to use your custom white balance, and In the future, you'll want to redo this each time you take photos. Update Here are red and blue squares, which may work (they're pure R and B from your computer screen) but I believe it's best to use a very clear pure red or blue material (paper) in the same sunlight as your actual photos, just before you start taking photos. In the camera you use in this example, press "Menu" while filling the scene with the blue paper. Then press Function/Set to begin taking photographs. In other Powershots, press the button indicated on the screen. It might help to do the custom white balance under a bright blue sky with no direct sunlight on the blue paper. the step-by-step instructions with photos are really helpful, thanks! 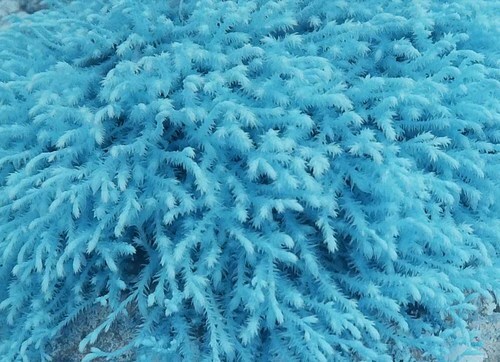 I thought plants will appear red using infragram? After processing they will. 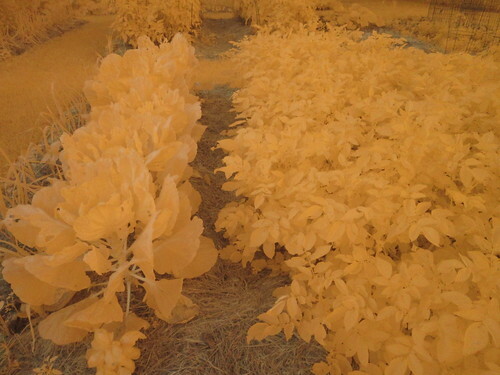 For example, upload the orange-ish photo to http://infragram.org/static/sandbox/ and click "NDVI" then "Color" and you'll get a colorized index of the NDVI value, which roughly correlates with health. Does the software also give an NDVI value? Is there any software that does analyze an image that also provides the actual NDVI values? We could have it show the value under where you're hovering the mouse. hey @cfastie and @warren , is it true that orangey looking photos indicate a well white balanced blue filter infragram, while blue/greyish photos indicate a well white balanced red filter infragram? Orangey yellow is good for blue filtered Infragrams. Turquoise blue is good for red filtered infragrams. Gray is bad. Below is a good red filtered Infragram color. @cfastie, I'm trying to do the white balancing manually using a Raspberry Pi and I need to know the number of this "pure blue" that you are using. After pointing the camera to a piece of paper with this blue, I want to obtain a grey image (the same as you did with a Canon Camera), I'd like to know the number of this grey too. Does anyone know it? I don't know the specs of the blue paper I use for custom white balance. The idea is to flood the blue channel with light (when using a blue filter) so the camera overcompensates and exaggerates the red channel in all subsequent photos. The red channel is used for NIR when computing NDVI (when using a blue filter) and the values in the red channel must be larger than the values in the blue channel for pixels where healthy foliage has been captured. The blue channel will capture NIR light as well as blue light, so the amount of NIR reflecting off the blue paper is important. I have never measured how much NIR or blue light reflects off my blue paper. I just know that results are best when the blue paper is reflecting the light from a deep blue sky (and not direct sunlight). With the R Pi camera it might be possible to set the color balance programatically. It would be good to learn how you are setting the white balance. Many people are interested in this.